Stylish one bedroom apartment for single person or couple. 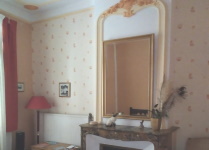 Converted from original reception rooms of the maison de vigneron. WIFI. Central heating. A self contained apartment suitable for a single person or a couple. The apartment has a combined lounge/bedroom with a comfortable two seater settee, a double bed and plenty of storage. 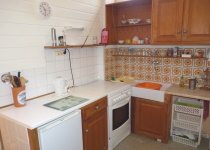 The well equipped dining/kitchen has a full gas cooker (with 4 gas rings, a grill and oven), a microwave, fridge with freezer compartment, an original sink, kettle and coffeemaker. The third room is the pretty shower room with wc. The main living/sleeping accommodation has been created whilst retaining the unique character of the original reception room. There is a marble fireplace, original floor tiles and ornate plasterwork on ceilings and walls. Shuttered french windows allow access to a small balcony (unsuitable for small children) at the front of the house. The apartment is centrally heated for the colder winter evenings and has WIFI access.